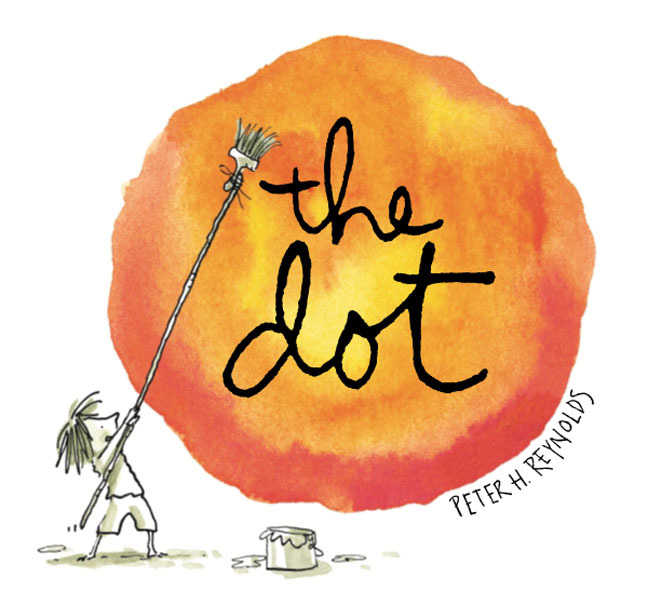 I love Peter H. Reynold’s The Dot. Not only is the main character named Vashti(! ), but the story sends a fantastic message about sharing who you are through art. If you haven’t read the story, here’s the gist (you’ll have to read the book for yourself to catch the illustrations): Vashti is frustrated by art class, because she believes that she has no artistic talent. Her teacher encourages her to make some kind of mark on her paper, and then asks her to sign it. When Vashti comes to class next, her signed dot is framed on the wall. Vashti decides that she can certainly make a better dot than that, so she sets out to outdo herself. By the end of the book, her fantastic profusion of dots is in an art show, and Vashti encourages a younger fan (with no artistic talent of his own) to make his own mark — and sign it. The book has been around for ten years, now, and those inspired by it have instituted International Dot Day on the book’s publication date each year — September 15 — to allow people all over the world to share how they’ve taken up The Dot‘s challenge. It’s Dot Day that suggested the idea for a new monthly feature for Lemon-Squash. Makerspace will introduce a different project the first Friday of every month, and provide opportunities for you to share what you’ve done with it. In the spirit of makerspaces, the feature will be a great opportunity to learn about and try new things. Some months I’ll share what I know about a topic, and others I’ll invite a mentor to share what he or she knows. We hope you’ll find it inspiring — we can’t wait to see where you take it! 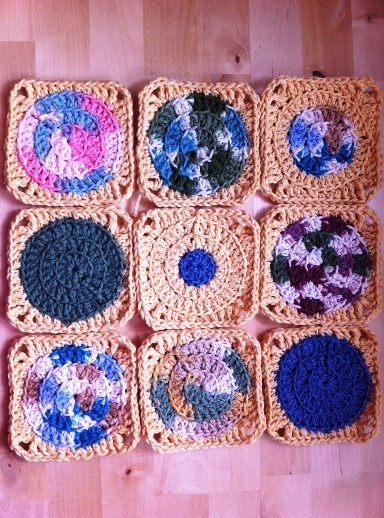 The pattern is pretty simple, and the squares would work equally well for a scarf, a rug, or a full bedspread. If you’d like to give it a try, and need to brush up on (or learn) the crochet stitches needed, you’ll find them all on The Purl Bee’s Crochet Basics page. Dot Day is all about finding your own way of expressing yourself, though, so try something that’s fun for you (or for the kids/teens you’re working with). Bake, draw, plant, decoupage, carve or write. When you’re done, consider sending us a photo. I’ll be posting a picture of my polka dot blanket on our Facebook page on September 15th, and we’d love to share your pictures, too! This entry was posted in Makerspace and tagged art, creativity, Peter H. Reynolds. Bookmark the permalink.